The potato came to Ireland in the late 1500s after it first arrived in Europe by way of Spain. Conquistadors brought the starchy vegetable back from the Andes Mountain region of South America where it originated. Eventually, the British experimented with it in Ireland (which was then occupied and governed by Britain) as an inexpensive food for Irish peasants. It was a highly nutritious crop and fairly easy to grow and maintain. It grew underground and was less susceptible to damage from most natural causes, as were wheat fields, for example, and man-made causes like wars and rebellions -- which occasionally occurred in troublesome Ireland. The potato has many vitamins and minerals; and when it was mixed with a dairy food like milk or cream or buttermilk -- which had the needed vitamins the potato lacked -- it provided a rather balanced meal. As a result, potatoes and buttermilk became the main food source for the vast majority of Irish peasants who worked on small farms throughout Ireland -- often owned by absentee English landlords. From the early 1600s until 1845, it is safe to say, generally speaking, that the Irish lived on potatoes. In 1845 a fungus caused the potatoes in Ireland to blacken and rot and become inedible. The vast majority of Irish, who were dependent on this crop, mainly because of a long history of British oppression in Ireland, lost not only their food source but also their revenue source since they could not sell the diseased potatoes. Although there was an abundance of other food in Ireland, it was completely controlled by the British. Left with no livelihood and no food, under a British occupation, one million Irish people starved to death in Ireland and about another one million sailed away in disease-filled and often unseaworthy vessels called “coffin ships.” Most of the emigrants came to the United States. By 1850 the worst of the “Potato Famine” or Great Hunger was over in Ireland. Eventually, the potato returned as a valuable food source for the Irish. As a result of this long, though often tragic, history, the potato is typically associated with the Irish. So, when we eat a hot and nutritious bowl of Irish Potato Soup on a cold winter’s night, we should think about not only what a great, healthy, easy-to-make, inexpensive, and tasty dish it is, we should also think about the millions of Irish people in the past who endured great tragedies because of the destruction of the potato and bigoted indifference to human suffering. Below is a description of a very simple and rustic Irish Potato Soup I made. 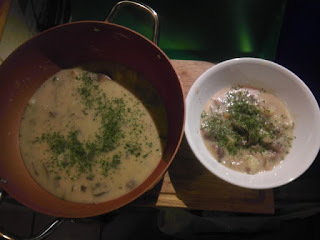 As usual, I do not give a specific recipe for an Irish dish but just list the main ingredients and let the reader concoct his or her own version. 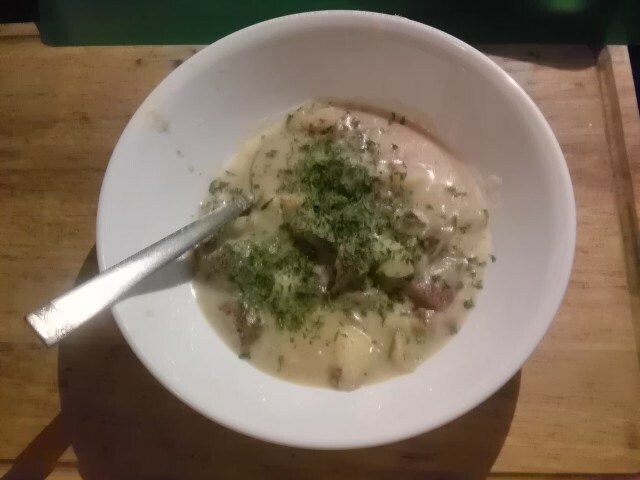 If you look at cookbooks or scan the internet, you can find many different ways to make Irish Potato Soup. All are probably fine; there is no one “right” way. parsley. And water, butter or oil (not shown). It is significant to note that the potato is not just important in Ireland and in America, but it is the fourth largest food source cultivated in the world today behind corn, wheat, and rice. 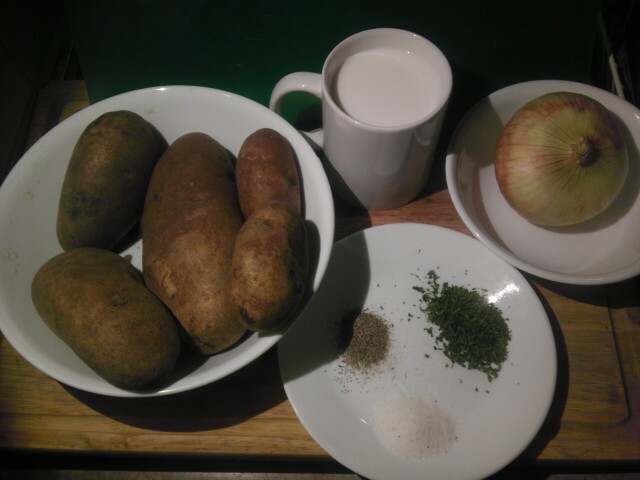 For my simple “Irish Potato Soup,” I will use the following: Irish potatoes (baking potatoes), yellow onion, cooking oil or butter, milk, salt and pepper, dried parsley. That is it. You have a delicious and filling meal that reaches back into Irish and Irish American history. Are potatoes an important cash crop in Ireland today? Yes. In fact yesterday, October 7th, much to my surprise I discovered with a little research, was National Potato Day in Ireland. Here is a link to an article from the "Irish Mirror" newspaper which discusses the importance of the potato in Ireland and National Potato Day. http://www.irishmirror.ie/whats-on/food-drink-news/happy-national-potato-day-heres-4367996 It says the Irish eat 85 kg of potatoes each year while 33kg is the average internationally. It says there are 540 potato growers in Ireland and 96.4% of households eat potatoes. It says the potato crop is annually worth 195 million euros for the Irish economy.It says the potato first came to Ireland in 1580. (Some people claim Sir Walter Raleigh brought them, I heard elsewhere.) See more at the article "Happy National Potato Day: Here's 13 Interesting Facts about the Humble Spud" by Claire Healy, 7 Oct 2016. Thanks for your interesting question; see the response above.